"It pleased the father, that in him should all fullness dwell." Col. 1:19. "In whom are hidden all the treasures of wisdom and knowledge." Col. 2:3. To all true Israelites, in whom there is no guile—Grace, mercy, and peace, from God the Father, through our Lord Jesus Christ, be multiplied. My design in appearing once more in print is not to please the captious critic, or the sullen cynic—but to heighten your "fellowship with the Father and the Son," 1 John 1:3-4, and to further you in a closer walking with God, and to ripen you more and more for reigning with God when you shall be here no more. "Beloved in our Lord," there are two sad and great evils—oh that there were no more!—among the saints this day. The strong are very apt, yes, they make little of offending the weak; and the weak are as apt, and make as little of judging and condemning the strong, Romans 14:1-10. The serious and conscientious perusal of this treatise may, by the blessing of the Lord, contribute much to the preventing of those sad evils. You who are weak may, in this treatise, as in a mirror, see your weakness, your mercies, your graces, your duties, your privileges, and your comforts. You who are weak in grace, may here find many questions answered and doubts resolved, that tend to the satisfying, quieting, settling, and establishing of your precious souls in peace, joy, and assurance. You who are weak in grace, may here find a staff to support you, a light to direct you, a sword to defend you, and a cordial to strengthen you, etc. And you who are strong in grace, may here see what is your way, what is your work, and what at last shall be your reward. Here you will find that which tends to the discovery of spirits, the sweetening of spirits, the uniting of spirits, the healing of spirits, and the making up of breaches, etc. Here you will find "meat for strong men," and "milk for babes." Here you will find who is more motion than notion; more heart than head; more spirit than flesh; more inside than outside, etc. Here you will find "the unsearchable riches of Christ"—which of all boxes of precious ointment is the most precious—opened; and oh how sweet must he be, who is the sweetest of sweets! In Christ are riches of justification; in Christ are riches of sanctification, riches of consolation, and riches of glorification. And this following treatise may serve as a golden key, to open the door, that you may come where these treasures lie. Christ's riches are like the eternal springs of the earth, which cannot dry up—but are and shall be diffused by his Spirit and gospel, until his whole house be filled with them. 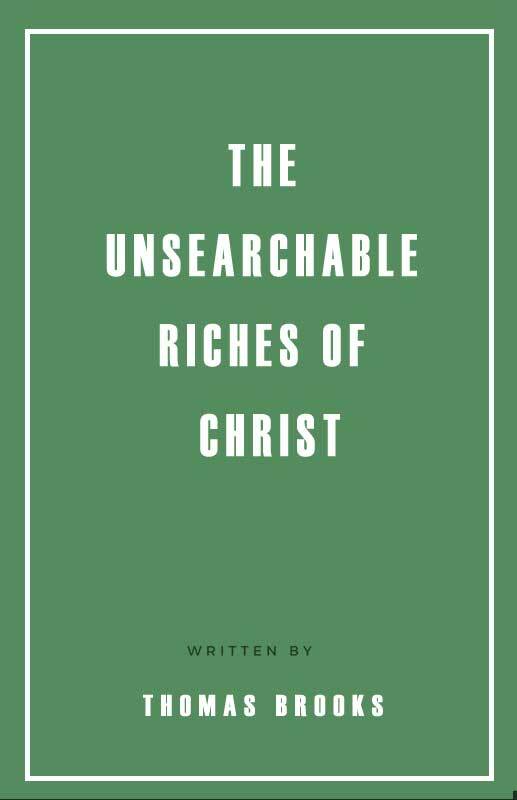 The excellency and usefulness of the riches of Christ, and answers to many weighty queries about his unsearchable riches, is more than hinted at in this tract. In this tract much is spoken concerning the nature, properties, and excellencies of humility, which is both the beautifier and preserver of all other graces. And if ever there were an age since Christ was on earth, wherein it was needful to preach, press, and print this great doctrine of humility, of self-abasement, of soul-abasement, this is the age wherein we live. Oh the pride, the loftiness of the professors of this age! But because this point is largely spoken to in this tract, I shall satisfy myself with this touch. There are many other weighty things treated on, which for brevity's sake I shall omit, only give me permission to acquaint you with a few things about this ensuing tract, and then I shall draw to a close. First, That it is the substance of twenty-two sermons, preached by me about three years ago, on the lecture nights at this place where now I preach. Secondly, That there are in it several other things of no small concernment to your souls, that I did not then deliver—but have been given in since, from that fountain that fills all in all. I have only a few requests to make to you, and then I shall take my leave of you. And my first request is this, that you would meditate and dwell upon what you read; otherwise your pains and mine will be lost. It is a law among the Parsees in India, to use premeditation in what they are to do, that if it be bad, to reject it; if good, to act upon it. The application is easy. The more any man is in the contemplation of truth, the more deep and firm impression is made upon his heart by truth. Christians must be like the clean beasts, which parted the hoof and chewed the cud; they must by heavenly meditation chew truths, or else they will never taste the sweetness that is in divine truths. Mary "pondered the sayings of the shepherds in her heart," Luke 2:19. Not those who eat most—but those who digest most, are the most healthful. Not those who get most—but those who keep most, are richest. So not those who hear most, or read most—but those who meditate most, are most edified and enriched. To read much and practice nothing, is to hunt much and catch nothing. Suetonius reports of Julius Caesar, "That seeing Alexander's statue, he fetched a deep sigh, because he at that age had done so little." I have read of a good man coming from a public lecture, and being asked by one whether the sermon was finished, answered, with a sad sigh, "Ah! it is preached—but not finished." My third request is this, that you will pray over what you read. Many read much, and pray little, and therefore get little by all they read. Galen writes of a fish called Uranoscopos, that has but one eye, which looks continually up to heaven. When a Christian has one eye upon his book, the other should be looking up to heaven for a blessing upon what he reads. When one heard what admirable victories Scanderbeg's sword had wrought, he would needs see it; and when he saw it, says he, This is but an ordinary sword; alas! what can this do? Scanderbeg sent him word, I have sent you my sword—but I have the arm that did all by it. Alas! what can Christ's sword, Christ's word, do without his arm? Therefore look up to Christ's arm in prayer, that so his sword, his word, may do great things in your souls. Luther professes "that he profited more by prayer in a short space than by study in a longer;" as John, by weeping, got the sealed book open. My fourth request to you is this, That if, by the blessing of the Lord upon my weak endeavors, any leaf or line should drop myrrh or mercy, marrow or fatness, upon your spirits, that you will give all the glory to the God of heaven, for to him alone it does belong. Pliny tells of some in the remote parts of India, who have no mouths, and yet live on the smell of herbs and sweet flowers; but I hope better things of you, even such as accompany salvation. My fifth request to you is this, That you would let me lie near your hearts, when you are in the mount especially. Oh pray, pray hard for me, that the Spirit of the Lord may be redoubled upon me; that his word may prosper in my mouth; that it may "run, and be glorified;" and that I may be high in my communion with God, and holy and unblamably in my walkings with God; and that it may be still day with my soul; that I may live and die in the joys and comforts of the Holy Spirit; and that when my sun is set, my hour-glass runs out, my work done, my race run—I may rest in the everlasting arms of divine love, etc. God's easy passing over the many and daily erratas of your lives, cannot but make you so ingenuous as readily to pass over the erratas in this book. You are choice jewels in my eye; you lie near unto my heart; I am willing to spend and be spent for your sakes. My earnest and humble desire is, that my service and labor of love may be accepted by you, Romans 15:31, and that it may work much for your internal and eternal welfare; and that "an abundant entrance may be administered to you into the everlasting kingdom of our Lord and Savior Jesus Christ," 2 Pet. 1:11, and 1:8; and that you may be filled "with joy unspeakable and full of glory," and with that "peace which passes understanding." This is, and by grace shall be, the prayer of him who desires to approve himself faithful to Christ, his truths, his interests, and his people, and who is your souls' servant in all gospel engagements. Those who are lowest in their own esteem, are highest in God's esteem. Eight motives to provoke believers to be humble. Nine directions and helps to keep us humble and low in our own eyes. The dangerous nature of pride held forth in nine propositions. Six ways wherein pride shows itself. All saints are not of an equal size and growth in grace and holiness. Twelve things by which souls weak in grace are discovered and deciphered. Twelve supports and comforts to uphold weak Christians. Six duties which lie upon weak saints. The duties of strong saints to the weak shown in eleven particulars. That the Lord gives the best gifts to his best beloved ones. What those best gifts are, which Christ bestows upon his dearest ones, shown in ten particulars. The difference between Christ's giving and the world's giving, shown in six things. The excellency of those gifts which Christ gives, above all other gifts that the world gives, shown in five things. Six reasons why God gives the best gifts to his dearest ones. Eight sweet inferences or uses made of this point. A word to unsaved sinners. That the gifts and graces which God bestows upon his people should be improved, employed, and exercised by his people. This point proved and opened. Twelve reasons why gracious souls should exercise and improve their gifts and graces. Three special ends that the gifts and graces which God has bestowed upon believers should be exercised and improved to. Seven considerations or motives to stir saints up to improve their gifts and graces. Question: When may a soul be said to be excellent in grace, or to have highly improved grace? This question receives ten answers. That the Lord Jesus Christ is very rich. This point is opened and proved by eight arguments. Four grounds and reasons why the Lord Jesus Christ is held forth in the word to be so very rich. The excellency of the riches of Christ above all other riches in the world, held forth in seven particulars. 1st Use. To exhort Christians to labor to be spiritually rich. Seven considerations or motives to work Christians to this; in the handling of which, several weighty questions are answered. Question: What means must Christians use that they may grow rich in grace? Answered in eight things. Seven propositions concerning spiritual riches. The serious minding of them may give to many much satisfaction, and prevent many objections. Five marks of a person who is spiritually rich. Nine directions to poor souls who would gladly get a interest in Christ. That it is the great duty of preachers or ministers to preach Jesus Christ to the people. Five reasons why ministers must preach Christ to the people. How Christ is to be preached, shown in eleven things. Three rules or directions, that such are to observe, as would preach Christ aright to the people. That the office of a faithful minister is an honorable office. I. Seven things speak them out to be honorable. Question: How must Christians honor their faithful ministers? Shown in five things.